Gilbert Town Historical Marker . 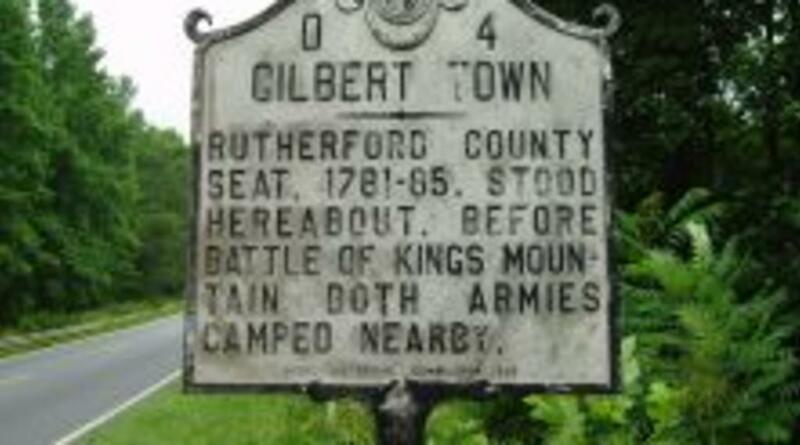 Gilbert Town is noted for the fact that both sides camped there before the Battle of Kings Mountain. Its founder, William Gilbert, born in Ireland around 1735, settled in present-day Rutherford County in 1760, having lived previously in Massachusetts and Pennsylvania. Gilbert married Sarah McCandless against her parents’ wishes while in Pennsylvania and fled to western North Carolina with his new bride. 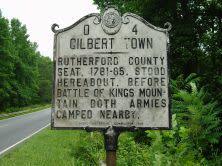 In 1769, after establishing himself in North Carolina, Gilbert began to purchase large tracts of land near his home, until he eventually became the largest landholder in Tryon County.